GM bypassed the customary auto show venue to debut the sixth generation Chevrolet Camaro. The new model has sharper lines, updated powertrain choices and a more modern cabin. The Chevrolet Camaro is back in the hunt. Just one year after Ford threw the gauntlet down with its 50th anniversary Mustang revision, Chevrolet picked it up and has raised the power bar too. In the 2016 Camaro, Chevrolet not only matches the Mustang’s line of four-, six-, and eight-cylinder engines, but does so by offering six new powertrain combinations. The three engine choices include a 275-horsepower, 2.0-liter turbocharged four-cylinder engine; an all-new, 335-horsepower 3.6-liter, V-6 engine; and a 6.2-liter, V-8 engine making 455 horsepower and 455 foot-pounds of torque. All three engines come paired with a TREMEC 6-speed manual transmission or an 8-speed automatic transmission. The sixth generation Chevrolet Camaro, debuting this fall, is a clean sheet update with only the Chevrolet emblem and SS badge carrying over. The new model weighs 200 pounds less than the outgoing Camaro, has improved sight lines and advances an even more aggressive stance. The turbocharged four will provide the best combination of performance and fuel economy. GM says that its gas mileage will be north of 30 mpg on the highway. Meanwhile, its 0 to 60 mph time will come in under six seconds. The naturally-aspirated V-6 raises performance to the highest level seen in a modern six-cylinder engine thanks to direct fuel injection and continuously variable valve timing. Moreover, active fuel management — representing technology that shuts down half the cylinders when traveling at constant speeds, such as on the highway — is included for the first time. But it is the crowning model in the Camaro’s line up that will have people wanting more. Indeed, the Camaro SS relies on an updated version of the small-block, 6.2-liter V-8 it has utilized in the past, what has been better optimized to produce more power than ever. 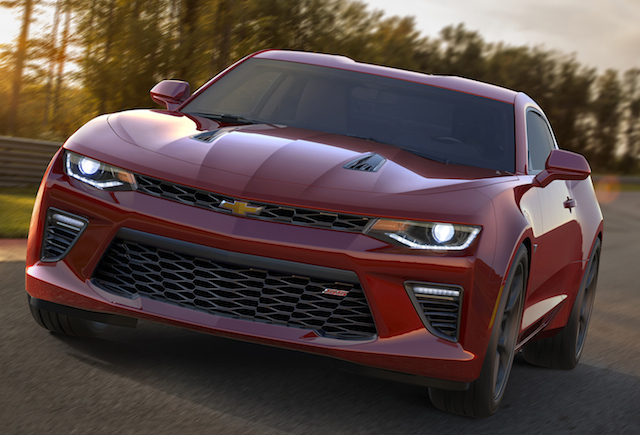 Furthermore, the Camaro SS will offer improved handling performance, augmented by an available magnetic ride control active suspension system, an SS first. Previously, only the Camaro ZL1 offered it. All 2016 Camaros will be outfitted with Goodyear rubber — 18-inch Eagle Sport all-season tires or available 20-inch Eagle F1 asymmetric all-season tires. The Camaro SS will feature standard 20-inch aluminum wheels and Eagle F1 Asymmetric 3 run-flat tires. Brembo brakes will be available across the model line and standard with the SS. 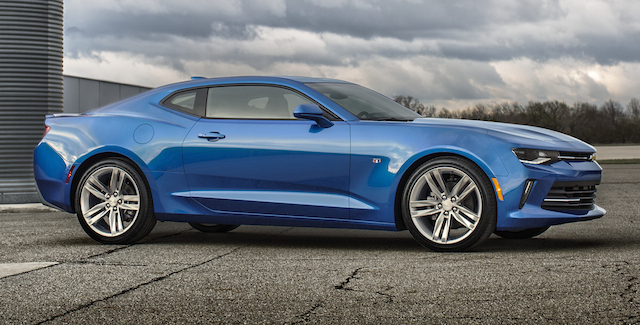 Technology will play an even more important role in advancing the 2016 Chevrolet Camaro. Even more, is how those technologies will improve the driving experience. 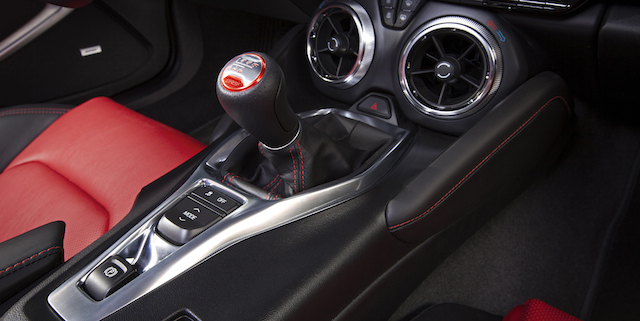 For example, the Camaro will get an all-new drive mode selector: Snow/Ice, Tour, Sport and – on SS models – Track settings. That’s something the 2015 Mustang rolled out and Chevrolet has responded to in kind. Ambient lighting is a big deal in today’s cars and the Camaro will have 24 different lighting effects that will be revealed in the center console, the door panels and on the dashboard. Configurable color displays, in high-definition, will be available in the form of dual 8-inch-diagonal screens. GM promised a lighter and leaner Camaro and they are making good on that promise. The new model is underpinned by the same platform powering the Cadillac ATS, with a more sculptured body. The upper grille is narrower, the lower grille broader, and the fog lamp recesses are sportier. The hood has fresh character lines with vent scoops included with the SS. The sixth generation Camaro not only loses some weight, but it measures 1.6 inches shorter between the wheels and 2.3 inches overall. The 2016 edition is also about one inch narrower and its height comes in 1.1 inches lower. More distinctive profile character lines, including sculptured rocker panel lines are present. The rear deck sits slightly higher and has a more furrowed look with a new rear diffuser and dual exhaust tips. Moreover, updated signature LED lighting treatments represent additional distinctives. The sixth generation Chevrolet Camaro comes in leaner and meaner than its predecessor and will offer stiff competition to the Ford Mustang. Both models make the Dodge Challenger seem extra large and heavy, but it is doubtful that loyal owners of all three pony cars will be swayed to switch to the competition. Camaro photos courtesy of the General Motors Company.